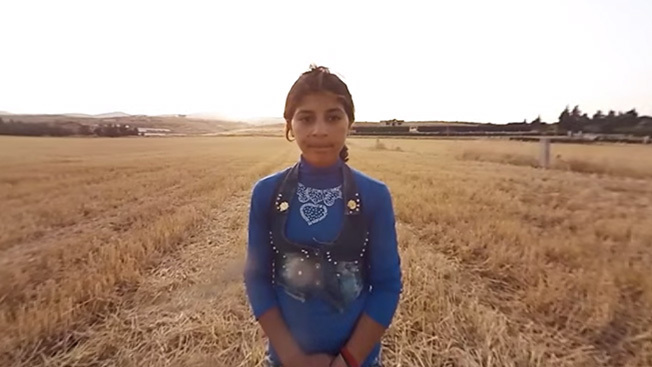 CANNES, France—The NYT VR project from The New York Times won its second Grand Prix of this Cannes Lions festival here tonight, with the individual virtual reality film "The Displaced," shot by Vrse.Works, earning the top prize in the revamped Lions Entertainment contest, to go along with the Grand Prix in Mobile that the NYT VR app itself won earlier this week. In addition, two Grand Prix were handed out in the separate Lions Entertainment for Music category. One went to production company Prettybird for Beyoncé's "Formation" music video, and the other went to agency Jung von Matt in Hamburg, Germany, for the musical track on its famous "Home for Christmas" Edeka supermarket ad, in which a grandfather fakes his death to trick his family into visiting him at the holidays. Lions Entertainment jury president Jae Goodman, chief creative officer and co-head of CAA Marketing, said the jury was up almost until sunrise Friday morning finalizing the distribution of Lions. They also had the burden of determining the criteria for awarding work in this revamped category, which used to be known as Branded Content & Entertainment. From the beginning, he said, the judges followed these criteria: The work had to be high quality, have a powerful relationship to the brand, attract an audience and not be interruptive, and be entertainment in its form and not just entertaining in its effect. "The Displaced," which immersed the viewer in the lives of three child refugees, was extraordinary both as an editorial and a marketing piece, said Goodman. Rather than describe its power, he urged the journalists assembled to watch it for themselves, but he did say that it satisfied one criterion in particular—the brand connection. "This is a piece of entertainment content that moves the brand and the business that created it forward," he said. Meanwhile, the Lions Entertainment for Music jury president, Josh Rabinowitz, evp and director of music at Grey Group USA, lauded both of his jury's Grand Prix winners as brave and groundbreaking. "It's been called a fiery black power anthem," he said of Beyoncé's "Formation" video. "It's pushing the limits on the way we perceive things in culture, the perception of women in culture. She performed this song on the Super Bowl 50 halftime show. There was lots of controversy around it. There's been lots of controversies surrounding the police, as she alludes to police brutality and race issues in America. When you can do something that's socially relevant in the mainstream, and you're such a big pop artist and you take a risk, it's one of the most powerful things you can do. Hats off to her, and we're really proud to award that the Grand Prix." The other Grand Prix winner, the Edeka spot, was honored for best use of original music—the tracked "Dad" by Neele Ternes, which reached No. 1 on what the case study called the "viral charts." The spot itself, with its provocatively bleak premise, was incredibly popular this past Christmas, causing a stir globally. "It's a heart-melting concept, a beautiful song," Rabinowitz said. "The story and the impact and the engagement was tremendous for a supermarket based in Germany. We're really proud of this piece of work as well." Adweek asked both jury presidents on Friday morning about awarding Grand Prix to the Beyoncé video and the New York Times film in particular—given that the former is primarily a work of art, and the latter primarily a work of editorial journalsm, and that neither is first and foremost a piece of marketing. Both Goodman and Rabinowitz argued both winners were indeed powerful pieces of marketing, whatever their other purposes. "It's a piece of editorial content on the one hand, but the way they delivered it is absolutely marketing," Goodman said of the Times film. "The creation of the NYT VR app—that in and of itself catapults The New York Times, known as the Grey Lady, in our opinion 100 years forward. And then to deliver such a compelling piece of content over that app that they created. Moreover, the way it was initially delivered—they packaged, with the Sunday New York Times, 1 million Google Cardboards with The New York Times logo on the outside, so that 1 million people who otherwise would not be able to experience a new medium were able to experience it through the window of the Times brand. In our opinion as a jury, that's marketing." One of the jurors, Kristin Patrick, the global CMO of Pepsi, echoed that. "We debated this question a lot last night," she told Adweek. "One of the things we talked about was that the worlds of entertainment, brand marketing and the media world are all coming together. We partner with media partners to create our content now. In fact, we looked at something last night from Netflix that was created by the Wall Street Journal. We are trying to think about new and interesting ways to leverage our media buys. We're actually, at PepsiCo, getting into content and content creation, investment in content. The worlds are coming together in almost an unprecedented way." Rabinowitz also weighed in on the Beyoncé video. "Certainly a music video is a promotional tool, in its essence," he said. "It is free from a commitment to a concept, generally speaking. But it is clearly a promotional tool. It is funded by a major global corporation, a record label … You could imagine the dollars that went into this whole production, given where it came from. That's why we feel like it's certainly as aspect of marketing."